Few Canadians know about the plight of the 115,000 British Home Children who immigrated to Canada from the U.K. from the late 1860s to 1948. Many found their real purpose was to provide cheap labour. They were told they would be leaving the bleak conditions of England for fresh air, clean country living and a better life in Canada. But George Beardshaw, one of the children who made that trek, says that when he arrived alone at an Ontario farm back in 1938, it was soon made clear to him what was expected. 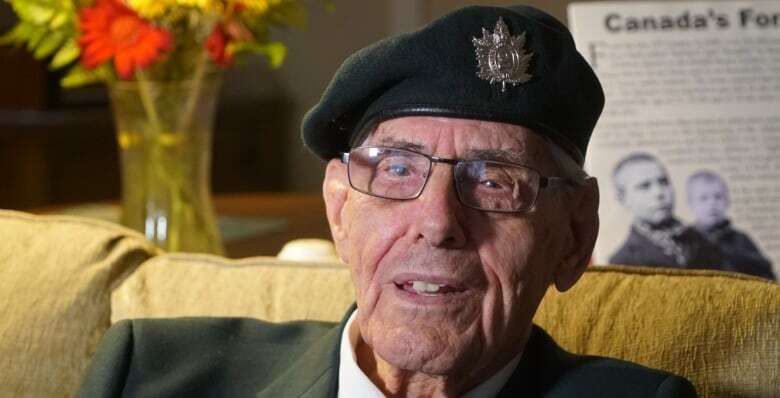 "I was there to work," says 94-year-old Beardshaw, sitting in his London, Ont., home. "They told me that many, many times: 'You're here to work.'" Beardshaw's mother was unable to look after her three boys and sent her sons to an orphanage in Woodford Bridge, Essex. Both his brothers had left the orphanage, with one settling in Canada. So when the school inspector came around asking who would like to go to Canada, Beardshaw raised his hand. "I wanted to come over here and be a cowboy, or see the wheat fields," he said. Instead, only minutes after he arrived at the Little Britain, Ont., farm, 100 kilometres northeast of Toronto, the then 14-year-old was told to put on coveralls and mow the lawn. In reality, Beardshaw, like so many of these children, found their real purpose was to provide cheap labour. "They never did a damn thing for me," Beardshaw says. "I worked, worked, worked, worked." Lori Oschefski, CEO of the Barrie, Ont.-based British Home Children Advocacy and Research Association, said few Canadians know about the plight of the 115,000 British Home Children who immigrated to Canada from the U.K. between the late 1860s and 1948. She learned that 75 children are buried in two graves that were unmarked for years in Toronto's Park Lawn Cemetery. To ensure they are not forgotten, Oschefski spearheaded a campaign to erect a monument on the site, with all 75 names inscribed, to be unveiled on Sunday. "We need a place to go and remember these children. A place to go and mourn the loss of these children." About four million Canadians are descendants of British Home Children. Oschefski said the scheme was born out good intentions, with over 50 organizations involved to bring children to Canada. Thousands of children in Britain were living in squalid conditions, their families in dire straits. Some families, she said, felt they had no choice but to give up their kids to these organizations, hoping they would have a better life in places like Canada. Only about two per cent of the children shipped over were orphans. 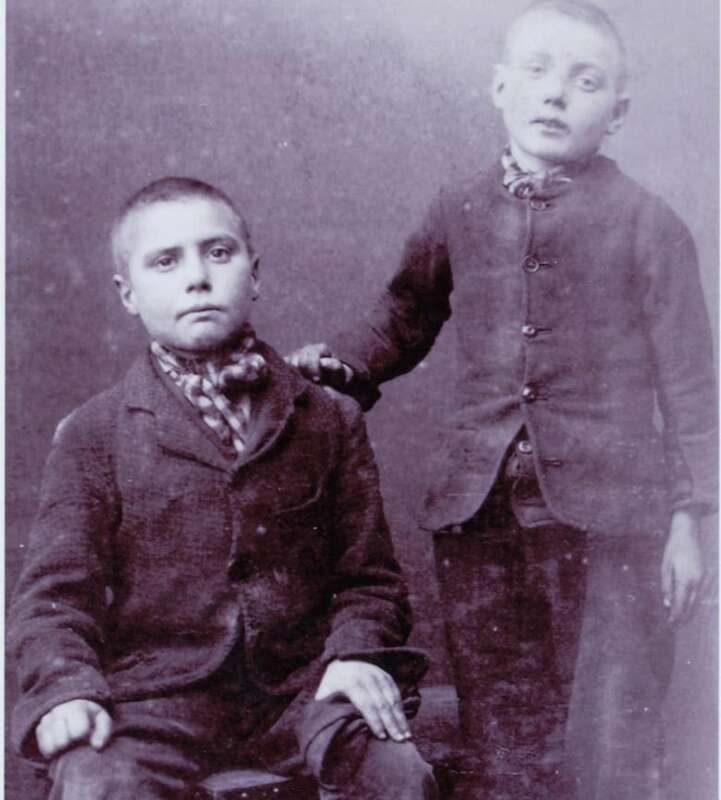 The British charity Barnardo's sent 30,000 to Canada, and many became known as the Barnardo Home Boys. "Some did receive good homes and some were accepted in as members of the family," said Oschefski. "But those instances of that happening are far and few between." "The vast majority of these children were treated as workers, these children were not welcomed as family members." Oschefski, who has spent years researching and tracking down the identities of the children, said many were housed in deplorable conditions and abused. Arthur Clarkson, for example, who arrived in 1907 at the age of 12, was kept in a cold attic with no glass in the windows at a Tillsonburg, Ont., farm. Snow got into his room and ended up on his feet, causing them to swell, Oschefski said. Clarkson couldn't fit into his boots, so he was forced to work outside in his bare feet. When he was unable to work, the farmer whipped him, she said. While an inspector eventually removed him from those conditions, his feet were permanently deformed. "A lot of the children were made to sleep in barns ... not fed very well and a lot of them were physically abused, whippings and beatings, some girls sexually abused." Oschefski's passion for this issue has roots in her own history — family members, including her mother, were British Home Children. While her mother's experience was generally positive, her aunt Mary was whipped, beaten and raped, and moved 20 times in less than eight years. Some children, she says, were murdered, including Charles Bradbury, a young teenager who, in 1897, worked on a farm in Goderich, Ont., and got into a scrap with the farmer's son. That evening, Bradbury's body was found in a burned-down barn. His throat had been slashed. 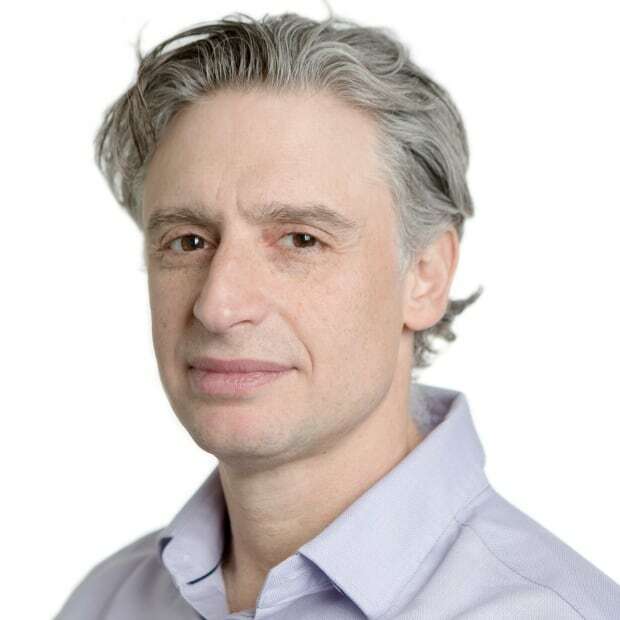 The official cause of death was suicide, a finding Oschefski believes is "inconceivable." 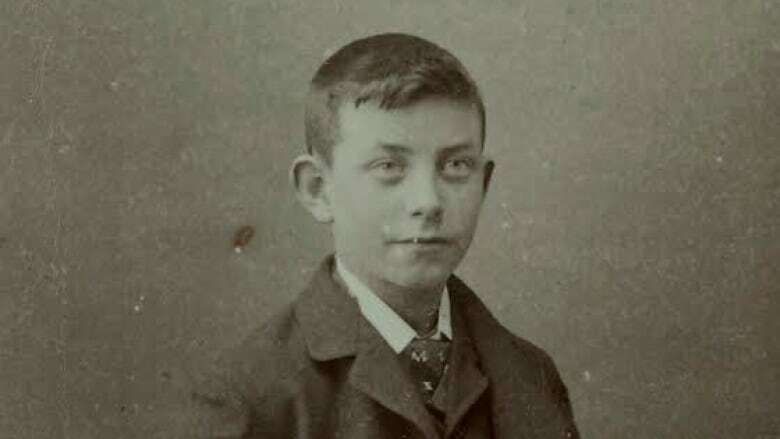 Bradbury is one of the 75 children buried in Park Lawn Cemetery. They were discovered quite by accident, when Oschefski and her husband visited an antique store in downtown Toronto about four years ago. The shopkeeper said he and his friends had played in that cemetery as kids and heard rumours of a mass grave of Barnardo children. 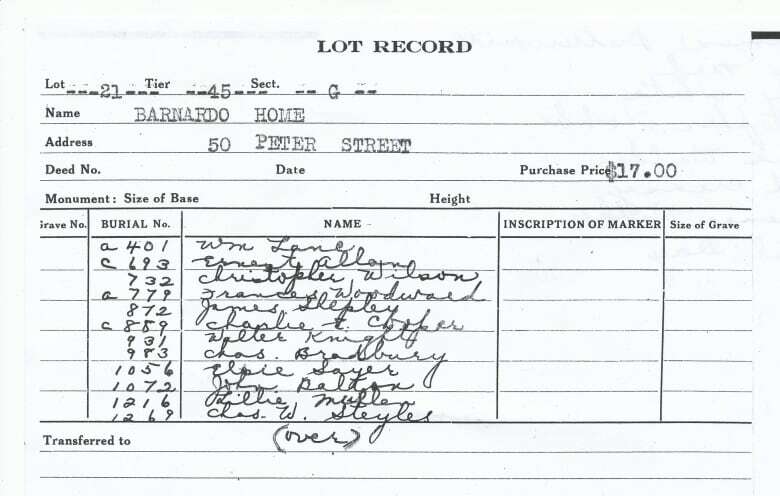 Using archival records, death certificates and cemetery plot cards, Oschefski was able to identify all 75. "We know how each and every one of them died. They represent the worst of the worst," she said. "They represent everything that was wrong with child immigration into this country, everything that was wrong with these child immigration programs. "How could they do that to kids, just dispose of them like that and erase them? It's like they never existed."